teNeues has published a book, Ultimate Lighting Design, featuring quite a few of my photos (buy it from Amazon and earn me some measely commission). 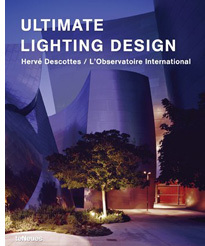 It's a 500+ page hard-cover book featuring the work of New York lighting design firm L'Observatoire. They've worked with all the top names in architecture and the book features an impressive list of cool buildings. I haven't yet seen the actual book, but from what I saw in the layout stages, it's full of beautiful photography (not least of all mine—I'm very happy with the photos I took for this book). Look for my work in the following sections: The Standard Downtown LA, The Standard Hollywood, Chateau Marmont (these three are André Balazs' hotels in L.A.), Jean Georges Shanghai, 66 and Perry St (these three are Jean-Georges' restaurants), and Beige (this one is Alaine Ducasse's restaurant in Tokyo).